Ever since the start of the website about two years ago we have had one thing which was a bit annoying: we didn’t ‘have’ the @stateofsearch Twitter account. That account was taken by an Italian artist who lived in Dublin. We tried contacting her in different ways to try and take the Twitter account of her hands. After all, she had not used the Twitter account since she claimed it in 2009. There was only one tweet on it. We never got in touch with her and were therefor “forced” to use the Twitter account @state_ofsearch, so with the underscore. We have ‘lived’ like that for two years. Until today. As of today we now own the Twitter account @stateofsearch. All followers of @state_ofsearch have been ‘moved’ to @stateofsearch, so if you were following us already: don’t worry, you will still see the same updates, you only have to keep an eye on the @replies you do towards us, but we’ll keep monitoring that, also because we also own @state_ofsearch. And if you are not following us: what? Do it right now! The process of getting the Twitter account seems long, in fact it turned out to be quite easy. Within 10 days everything was fixed. Let me explain how I got the account, without actually getting in touch with the account owner. The first step is to check if you can take the account from the original owner, that probably is the fastest way. Important here is whether or not the owner is actually using the Twitter account. If they are you will hardly stand a chance with Twitter, if they are not, you might have a good shot at getting it if the owner won’t give it to you or can’t be reached. The next step is going to Twitter and getting in touch with them. 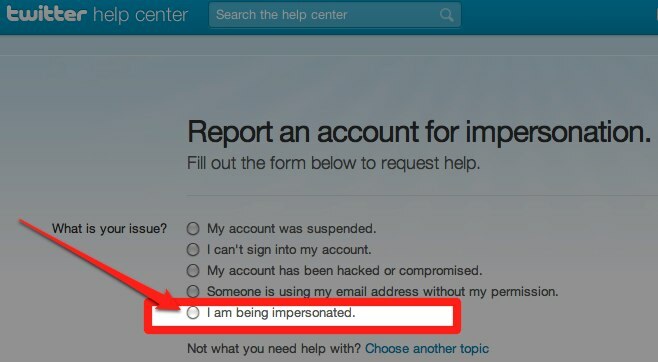 They have a special form you can fill in to “Report an account for impersonation“. Here I chose the option “I am being impersonated.” You then get a form which you have to fill in with as much detail as you can. Very important here is the “About the impersonating account“-part. Here you have to fill in how this account is an impersonation. Make sure you explain as much as possible, the fact for example that the account had not been used in a few years was important here, as well as the fact that we had the actual url to go with it. I also added “A lot of @replies to us are sent to them”, to give it some extra ‘schwung’. Within a few minutes I received a auto-confirmation e-mail from Twitter that they would go and look at the claim. After 8 days I received an e-mail saying that Twitter was able to release the username for me. They asked me to create a Twitter account or if I already had a Twitter account to reply to the e-mail so they could connect it. I replied back that the account could be connected to @state_ofsearch. One thing you then should not forget doing is to claim your “old” account, in my case @state_ofsearch. That after all was released when the username was transitioned. I claimed that right away to make sure nobody else would who could then mis-use it for something. I made sure that Twitter bio points at the new account. After all, there might be other sites on the web pointing at this Twitter account as being ours, we don’t want to lose those followers! On our own properties we have many links pointing to our Twitter account. We now have to change all those references on the site. Thats it. So from now on: (re)-tweet @stateofsearch! Finally a site that listens to impersonation requests! I did one on YouTube some time ago for one of my sites and I never heard anything back. I submitted a further 2 times and still didn’t get a response. I was quite disappointed at the lack of care given by YouTube. @andy – youtube won’t do zilch unless you waive a trademark certificate under their nose. then you can get stuff zapped in hours including names. The only other way is to doggedly pursue the holder. If you can deduce their domain name, and it expires and you dropcatch it, you can regenerate a YT password request to get it if you’re *really* keen. Twitter use more discretion, you have to be a super-nag, but it can pay off! If the user hasn’t used it and you can show that people are @-replying that user when they mean you, you have a big chance you will get the account. Great guide, my personal twitter account is full of numbers and underscores because I have such common name and initials, I’m not convinced that Twitter will accept my impersonation claim, its pretty unlikely that anyone will want to impersonate me! I’ve been trying to get them to let me have @steveg for 2 years now. They just keep telling me too bad. I have the long form of my name, but rarely use it, and I have my old old hacker tag name that I stopped using a long time ago.. Maybe that is what isn’t helping me.. Some people used to use this tactic to claim other high profile business names that were not being used. It was my understanding that it is a lot more difficult to do now. Did you have to submit the claim under an email from the same domain? I was just curious what steps Twitter has put into place to prevent false impersonation claims.